Alexa may be a popular talking bot, but she has not yet acquired the “social” skills to turn that query into a conversation. A team of Emory students from the Department of Mathematics and Computer Science are trying to help her develop those skills sooner, rather than later. 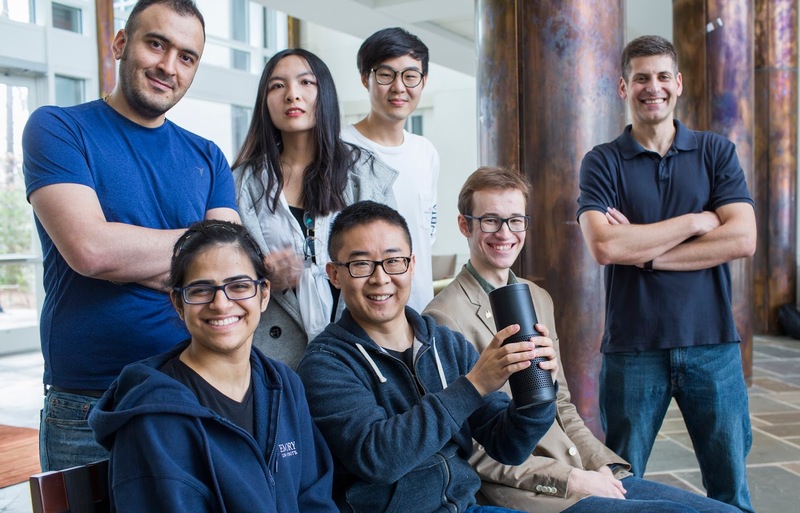 They are among eight university teams selected from around the world to create a social bot and compete for this year’s Alexa Prize. Amazon is sponsoring the $3.5 million university challenge in order to advance the conversational capabilities of bots such as Alexa — Amazon’s “personal assistant” software that responds to voice commands through a growing list of devices. Wang’s teammates include Ali Ahmadvand, Jason Choi, Harshita Sahijwani and Sergey Volokhin — all graduate students — and senior Mingyang Sun. The team’s faculty advisor is Eugene Agichtein, an associate professor of Mathematics and Computer Science. Each of the university teams received a $250,000 research grant, Alexa-enabled devices, and other tools, data and support from Amazon. A $500,000 prize will be given next November to the team that creates the best social bot, while second- and third-place teams will receive $100,000 and $50,000. Additionally, a $1 million research grant will be awarded to the winning team’s university if their social bot achieves the grand challenge — conversing coherently and engagingly with humans for 20 minutes with a user rating of 4.0 or higher. Agichtein’s IR Lab is developing new techniques for intelligent information access, including Web search and automated question answering. Conversational search capabilities are a key emerging trend, he says. Wang is a native of China who earned his master’s in civil engineering at Carnegie Mellon University. A robotics project sparked his interest in information retrieval powered by machine learning, leading him to Emory and Agichtein’s lab to work on his PhD. Autonomous vehicles, drones, online shopping mechanisms and robots designed to detect and remove dangerous objects are just a few examples of how machine learning is being applied. “The idea is to train an algorithm to ‘learn’ patterns embedded in data,” Wang explains. While a machine learning algorithm to simulate natural, human conversation is a difficult challenge, Wang says it’s one well worth pursuing. Possible healthcare uses for conversational social bots include providing companionship to isolated seniors, serving as therapeutic agents for people suffering from depression and conducting patient interviews to streamline admissions to a medical clinic. Wang also led an Emory team in the inaugural Alexa contest last year, but the team did not make it to the finals. “We learned a lot from the experience,” he says. Starting in May, the public can access competing bots to provide feedback and rate them by saying, “Alexa, lets chat,” to an Echo device, or to the Amazon mobile app. The bots will be randomly assigned and remain anonymous, so that people providing feedback cannot identify the university that generated them. By August, Amazon will have used this feedback to winnow the contestants down to three finalists that will continue to get more consumer feedback until the winner is announced in November. Other university teams competing this year include: Heriot-Watt University in Edinburgh, Scotland, Czech Technical University in Prague, Brigham Young University, UC Davis, KTH Royal Institute of Technology in Stockholm, Sweden, UC Santa Cruz, and Carnegie Mellon. Emory disease ecologist Thomas Gillespie served on an international committee that developed best practice guidelines for health monitoring and disease control in great ape populations, part of a growing public education effort. Thomas Gillespie’s parents and teachers always wanted him to go into medicine. “Growing up in Rockford, Illinois, if you were smart and interested in biology, you were supposed to be a doctor,” he says. Gillespie, meanwhile, was always more interested in primates. In seventh grade, he phoned animal psychologist Penny Patterson, famous for teaching the gorilla Koko how to use sign language, and interviewed the scientist about Koko’s diet while punching out notes on a typewriter. He was premed at the University of Illinois, but spent his internship at the Brookfield Zoo in Chicago, working in the “Tropic World” primate exhibit. His favorite undergrad course was biological anthropology, the study of biological and behavioral aspects of humans and nonhuman primates, looking at our closest relatives to better understand ourselves. 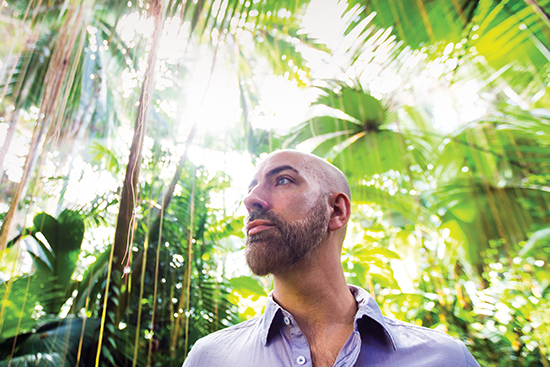 Gillespie eventually took a year off before graduate school to work with primate communities in the Peruvian Amazon. The apes finally won out — Gillespie would choose a doctorate in zoology over medical school. But it wasn’t long before the two fields of study collided. While monitoring the group behavior of colobine monkeys in Africa, Gillespie observed that some of the animals were eating bark from the African cherry tree — not a typical food source for them. When he dug deeper, Gillespie learned that human doctors in the region used that same bark to treat parasites in their patients. The monkeys, he realized, were self-medicating. “That discovery in these monkeys brought me back toward the health science side of biology,” says Gillespie. Gillespie’s return to a medical approach to zoology came not a moment too soon—for the sake of the primates and maybe even all of humankind. As an associate professor in Emory’s Department of Environmental Sciences specializing in the disease ecology of primates, Gillespie and his team of researchers have helped uncover a crisis among our nearest taxonomic neighbors. According to an article coauthored by Gillespie and thirty other experts and published in the journal Science Advances, 75 percent of the world’s five-hundred-plus primate species are declining in population, and a whopping 60 percent face extinction, largely due to human encroachment. Read more in Emory Magazine. Hair-raising, spine-tingling fun: A young visitor to the Emory campus during last year's Atlanta Science Festival experiences the thrill of static electricity. From the lumbering, 200-year-old Frankenstein to sleek, modern-day robots, this year’s Atlanta Science Festival — set for March 9 to 24 — highlights creations that spark wonder and fun, giving glimpses of the past and the future. The five-year-old festival expanded to more than two weeks, encompassing 120 events sponsored by 90 different partners at 70 venues across metro Atlanta, including many on the Emory campus. The festival culminates with a day-long “Exploration Expo” on Saturday, March 24, set in Piedmont Park. “Rise Up, Robots!” kicks off the festival on the evening of Friday, March 9 at the Ferst Center, when three robots and their inventors will take the stage. Heather Knight, professor of robotics at Oregon State University, will demonstrate the interactive quips of “Data,” the world’s first robotic comedian. Georgia Tech’s Gil Weinberg will jam with “Shimon,” a marimba playing robotic musician. And Stewart Coulter, from DEKA Research and Development, will show how a bionic arm named LUKE (Life Under Kinetic Evolution) changed an amputee’s life. Tickets are required for the event, which starts at 7 pm. Door open early with an Interactive Robotic Petting Zoo, starting at 6 pm. Frankenstein rises up on the Emory campus on Thursday, March 22. Three Atlanta playwrights will reanimate Mary Shelley’s creation, which turns 200 this year, in the context of scientific research ongoing at Emory. Following the short plays join ethicists, scientists and the playwrights to discuss the work over refreshments. The event, titled “Frankenstein Goes Back to the Lab,” begins at 5:30 pm in Emory’s Science Commons. On Friday, March 23, from 3:30 to 7 pm, Emory will host “Chemistry Carnival,” where visitors can join scientists in carnival games like Peptide Jenga and Bacterial Telepathy, in the Atwood Chemistry Center. On the same day and time, the ever-popular “Physics Live!” will again feature giant soap bubbles and liquid nitrogen ice cream, among other treats in the Math and Science Center. A new Emory event this year, “Science.Art.Wonder,” will run concurrently with the chemistry and physics events, on the Emory Quadrangle and in nearby buildings, including White Hall and the Atwood Chemistry Center. For the past year, the program has paired local artists and scientists to explore ideas of research through the visual arts. You can stroll through an exhibit of the resulting artwork and meet some of the artists and scientists involved in the project. Adult fare is featured on Monday, March 19, including “The Science of ‘Motherese,’” an overview of early vocal development in infants at the Marcus Autism Center, and “CDC in the Scene,” which features CDC scientists sorting fact from fiction surrounding movies like “Outbreak,” in the Mathematics and Science Center. On Tuesday, March 20, “Become an Archeologist” lets you in on secrets revealed by ancient skeletons and artifacts, while “Mock Climate Change Negotiation” turns you into an international policymaker for a day. During “Unveiling the Internet,” on Wednesday, March 21, Emory computer scientists will give interactive lessons on everything from the workings of YouTube to Snapchat. 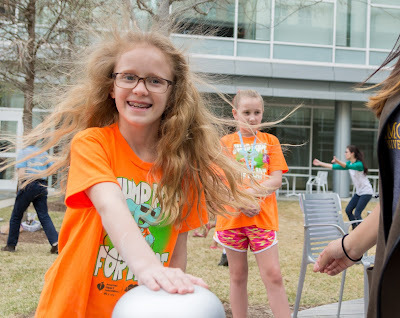 “STEM Gems: Giving Girls Role Models in STEM Careers,” on Saturday, March 10, is an interactive discussion where panelists offer advice and guidance specific to girls and young women intrigued by science, technology, engineering and math. “Women and Minorities in STEM: Surprises, Setbacks and Successes,” set for the evening of Thursday, March 22 at the Oxford campus, is a panel discussion with voices from a diverse set of scientific fields who will share their stories and take questions. Click here for more details of Emory campus events, and events throughout the city featuring members of the Emory community. Among the dozen Emory booths at “Exploration Expo” will be chemistry students running their non-Newtonian fluid dance pit. The Center for the Study of Human Health will explore the human gut microbiome in a booth called “Your Hundred Trillion Best Friends.” And the “Science.Art.Wonder” team will display art from the program and invite you to help create a mural. The Atlanta Science Festival was founded by Emory, Georgia Tech and the Metro Atlanta Chamber and is a collaboration among diverse community partners and sponsors. Tibetan monk Geshe Yungdrung Konchok (left) and Emory biologist Arri Eisen (right) pose with the Dalai Lama, who wrote an introduction for their new book, "The Enlightened Gene." The book explores how dialogue between scientists and monastics enriches understandings of biology, physics and other sciences. 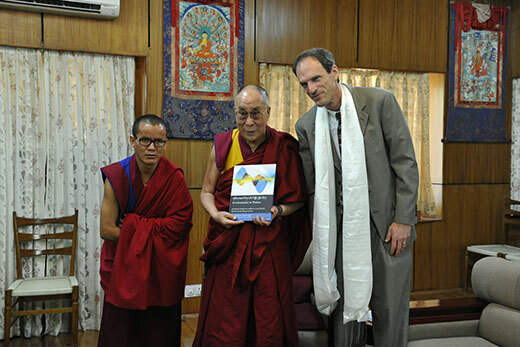 For nearly a decade, the Emory-Tibet Science Initiative has done more than challenge the idea that religion and science don’t mix by developing and successfully launching a comprehensive science curriculum for thousands of Tibetan monks and nuns. The first major change to Tibetan Buddhist monastic education in six centuries also demonstrated how insights and information from both the monastics and professors could enrich each other’s understanding of biology, physics and other sciences. Arri Eisen, an Emory College professor of pedagogy in biology and the Institute for Liberal Arts, explores those connections in “The Enlightened Gene,” a book he co-wrote with one of the monks, Geshe Yungdrung Konchok. Emory has woven Western and Tibetan Buddhist intellectual traditions together since founding the Emory-Tibet Partnership in 1998. His Holiness the Dalai Lama has been a Presidential Distinguished Professor at Emory since 2007. From ancient Egypt to modern times, cats rule many peoples' lives. Photo by Stephen Nowland, Emory Photo/Video. 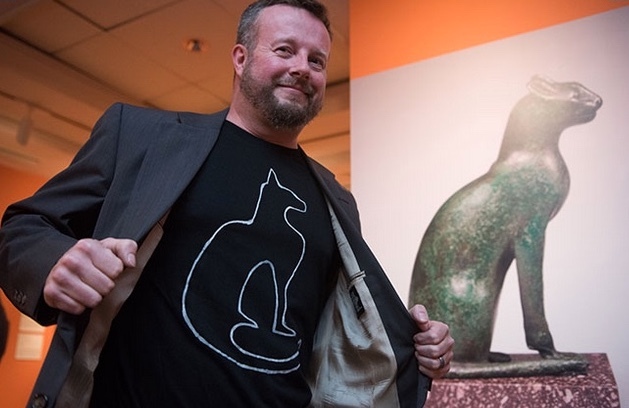 “In ancient Egypt, cats and dogs were gods, and they have not forgotten this!” says Melinda Hartwig, curator of Ancient Egyptian, Nubian and Near Eastern Art at the Michael C. Carlos Museum. That exalted stature is illuminated in the exhibition “Divine Felines: Cats of Ancient Egypt,” which opened Feb. 10 at the museum and will be on view through Nov. 11. The exhibit showcases cats and lions, plus dogs and jackals, as domesticated pets, creatures of the wild or mythic symbols of divinities, in ancient Egyptian mythology, kingship and everyday life. Animal burial practices and luxury items decorated with feline and canine features are also on display. The kings of Egypt were associated with the lion, thus, the human head on the lion’s body or the sphinx. Individuals who tend to think further into the future are more likely to invest money and to avoid risks, finds a new paper by psychologists at Emory University. The Proceedings of the National Academy of Sciences (PNAS) published the research, which tapped big data tools to conduct text analyses of nearly 40,000 Twitter users, and to run online experiments of behavior of people who provided their Twitter handles. The researchers also found an association between longer future-sightedness and less risky decision-making at a U.S. state population level. Co-author Robert Thorstad, an Emory PhD candidate in the Wolff lab, came up with the idea for the research, worked on the design and analyses, and conducted the experiments. The future-sightedness found in individuals’ tweets was short, usually just a few days, which differs from prior research suggesting future-sightedness on the order of years. “One possible interpretation is that the difference is due to a feature of social media,” Wolff says. Another possible reason, he adds, is that prior studies explicitly asked individuals how far they thought into the future while the PNAS paper used the implicit measure of previous tweets. While the relationship between future-sightedness and decision-making may seem obvious, the researchers note that previous findings on the subject have not been consistent. Those inconsistencies may be due to factors such as observer bias in a laboratory setting and small sample sizes. The PNAS paper used a suite of methods (such as the Stanford CoreNLP natural language processing toolkit and SUTime, a rule-based temporal tagger built on regular expression patterns) to automatically analyze Twitter text trails previously left by individual subjects. Experimental data was gathered using the Amazon crowdsourcing tool Mechanical Turk, a web site where individuals can complete psychology experiments and other internet-based tasks. Participants in the Mechanical Turk experiments were asked to supply their Twitter handles. In one experiment for the PNAS paper, Mechanical Turk participants answered a classic delay discounting question, such as: Would you prefer $60 today or $100 in six months? The participants’ Tweets were also analyzed. Future orientation was measured by the tendency of participants to tweet about the future compared to the past. Future-sightedness was measured based on how often tweets referred to the future, and how far into the future. The results showed that future orientation was not associated with investment behavior, but that individuals with far future-sightedness were more likely to choose to wait for future rewards than those with near future-sightedness. That indicates that investment behavior depends on how far individuals think into the future and not their tendency to think about the future in general. A second Mechanical Turk experiment used a digital Balloon Analogue Risk Task (BART). Participants’ could earn real money every time they inflated a balloon, but each inflation could lead to the balloon popping, resulting in no money earned for that trial. If participants stopped inflating before the balloon popped, they could bank the money that they have earned and proceed to the next trial. The BART participants’ tweets were also analyzed. The results showed that those with longer future-sightedness were less likely to take the risk of fully inflating the balloon. Another study in the PNAS paper focused on Twitter users whose profiles tied them to a particular state. About eight million of their tweets were analyzed for future-sightedness. The researchers measured a state’s risk-taking behaviors at the population level using the proxy of publicly available statistics, such as seat-belt compliance rates, drunken driving rates and teen-aged pregnancy rates. The results showed that shorter future-sightedness measures for tweets from individual states correlated closely to higher rates of risky behaviors, in a pattern similar to the results of the individual experimental studies. To measure a state’s investment behavior, the researchers used state statistics for spending on state parks, pre-kindergarten education, highways and per-pupil education. 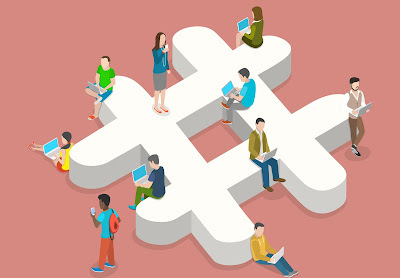 The researchers found that states that invested more in these areas were associated with tweets from individuals with longer future-sightedness, but not at a statistically significant level. The researchers controlled for state demographics such as political orientation, per capita income, household income and GDP. “We found that, while demographics are important, they couldn’t explain away the effects of future-thinking,” Wolff says. The estimated 21 percent of American adults who use Twitter tend to be younger and more technologically literate than the general population, Thorstad concedes. But he adds that Twitter’s demographics are not that far off from the general population in terms of gender, economic status and education levels. And the percentages of Twitter users living in rural, urban and suburban areas are virtually the same.